Interchangeable lenses help you see clearly in any light conditions when you're wearing Native Eyewear Dash SS Polarized Sunglasses. With Square Shaped (SS) lenses, you also get more protective coverage than standard lenses plus increased peripheral vision. 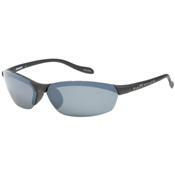 Hikers, runners, paddlers, and other outdoor athletes will be blown away by how easily the polarized lenses cut through the harsh glare of midday sun. Dash SS Sunglasses come with interchangeable lenses for versatility in different light conditions. Whether you're boating on a bluebird summer day or ski touring at night, the Dash SS has your back.